NOTE THAT BECAUSE OF TECHNICAL DIFFICULTIES, THERE IS NO LONGER A DOG APPLICATION FORM. SEE BELOW FOR WHAT TO DO!! If you don’t see a dog that you feel is suitable for you, please submit an application form anyway and we will take you through the approval process and get you ready to adopt. This is highly encouraged because when a dog comes to the rescue, we first look at waiting successful suitable applicants and we have many of them - become one now!. Please note that all our dogs are fixed and that it's our policy to never allow adoption of our dogs to homes with pets that are not fixed. Having fixed pets demonstrates that you are a responsible pet owner who has the financial means to take care of a pet, so if you have unfixed pets, get them fixed before applying for a Minpinerie dog. Thank you. To adopt a dog from the Minpinerie we ask for the above adoption donation. 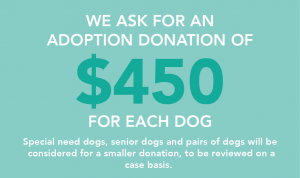 The adoption donation is essential for the Minpinerie to continue to provide care to dogs and helps contribute to a small fraction of the cost of rescuing a dog. Your adoption donation is put towards transportation, microchipping, food, vaccinations, deworming, medication, other vet care, leashes/collars and numerous other essential operational needs. Please see our FAQ for additional information regarding the adoption application process.